He pregames like you party! The National Football League's best rivalry is renewed tomorrow at noon as the Chicago Bears take to the road to face the Green Bay Packers in a showdown for bragging rights and division supremacy. And by the looks of things, there won't be need to panic for fan-favorite Caleb Hanie as it looks like Kyle Orton will be making a triumphant return to the huddle. For this blog's sake, I hope it is true. 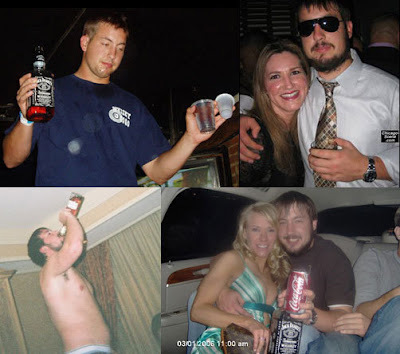 Heck, I hope he goes out and throws for 400 yards, 3 touchdowns and takes 10 shots of Jack Daniels in celebration. Only because I don't want to have to deal with anymore Rex Grossman bashing. Let's be honest, the Anti-Neckbeard could throw for 500 yards, 5 touchdowns, sack the Aaron Rodgers twice, pick three of his passes off and return them for touchdowns, return a kick and punt for a touchdown, save the economy, find Osama Bin Laden and invent a car that gets 300 miles per gallon ... and he would still be hated by Bears fans if he makes one mistake. I never thought I'd be swooning for the return of a former Purdue QB not named Drew Brees, but here I am. For the sake of this blog, Kyle, get it done! Saluki Nation preps for Civil War of sorts. The SIU football team picked up a HUGE 38-35 win against South Dakota State, but Saluki fans will turn their eyes out east for another football matchup of interest. The New York Giants and Baltimore Ravens square off Sunday, pitting two of SIU football's all-time greats, Baltimore LB Bart Scott and New York RB Brandon Jacobs. So who gets the best of this matchup. Will Scott use the Hit Stick on a former Saluki or will No. 27 use the circle button en route to another 100-yard game?